One month. It’s been one month since we made our 20-year dream of living in the Methow Valley a reality. One month since we loaded up all our worldly possessions in a 20 ft U-Haul truck and left our home of two-and-a-half years in Portland’s Pearl District for Winthrop, Washington. Not exactly a journey of a thousand miles. 400 miles to be exact, and eight hours of driving some of the most beautiful scenery the country has to offer. 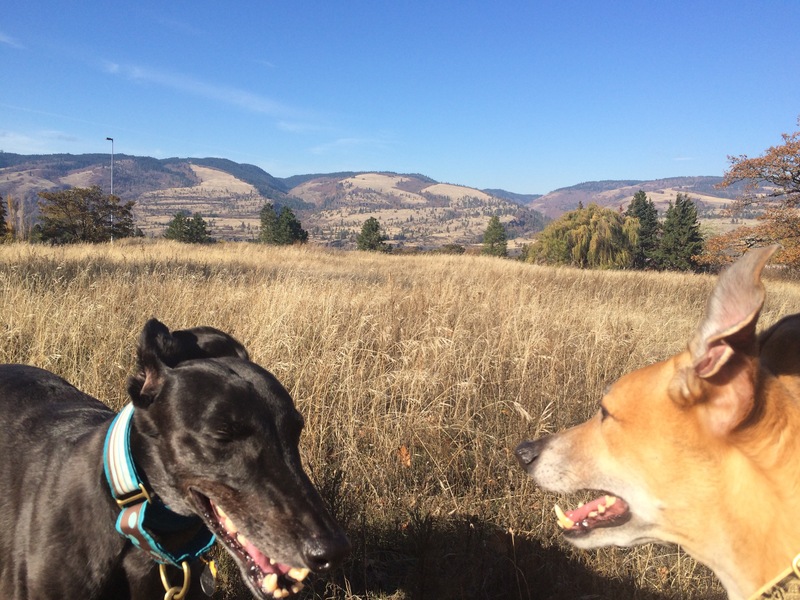 We headed east through the Columbia River Gorge to Highway 97, took a left and kept going. So much beauty. So much light. So dark at night. So many stars. So many animals. Deer. Birds. More deer. Still more deer. Small dark grey squirrels who yell at me. All. The. Time. So different from Portland and Seattle, where we have made our home for the last 22 years. We have talked about living in the Methow since we first started coming out here in 1996. After some tumultuous years, we decided the time was right to make the move. Flash forward six months. It’s now April 6. Almost 7 months to the day of our move out here. We not only survived, but enjoyed our first winter. Our first ‘real winter’ in decades brought a true appreciation of living again in a place that experiences all four seasons. We enjoyed exceptionally good ski and fat biking conditions on the 200km of groomed trails. It’s hard not to like winter all the outdoor activities available in the Valley. There are still patches of snow on the ground, but it is melting fast and things look dramatically different than they did in mid-February, when we topped out at 40+ inches of snow. The locals tell us this was a severe winter for the Valley, mainly because there was nearly a full week of double-digit sub-zero temperatures in January. But this was exactly what we expected winter here would be like. After two years of devastating wildfires, everyone we’ve talked with is appreciative of the healthy snowpack and cooler temperatures, and is cautiously optimistic that this will mean a less-severe fire season. As we ease into spring, we are seeing and hearing lots of birds, including a resident flock of wild turkeys. The dogs are obsessed with the turkeys almost as much as they are with deer. Which is to say, a lot. 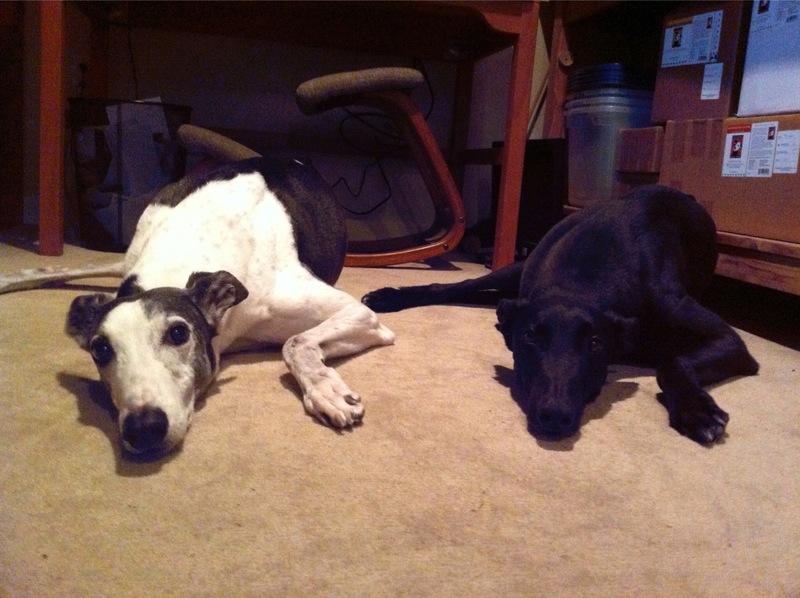 Speaking of the dogs, Tiger and Truman love their new home and have settled in incredibly well. We got them some super-warm coats and they even liked walking in the sub-zero temps. The humans have settled in well too. We love it here. We have two premium coffee roasters. A winery. A brewery. A craft cocktail bar. Decent grocery stores. Three killer bakeries. A handful of great restaurants, including an Italian place that impressed our friends from Italy who stopped by for a visit and some skiing this winter. We want for nothing here. Pretty amazing for a remote area on the eastern slopes of the North Cascades. This was a good move for all of us. We’ve been super busy the last month with our move to Winthrop, Washingon in the beautiful Methow Valley of North Central Washington. More on that soon. 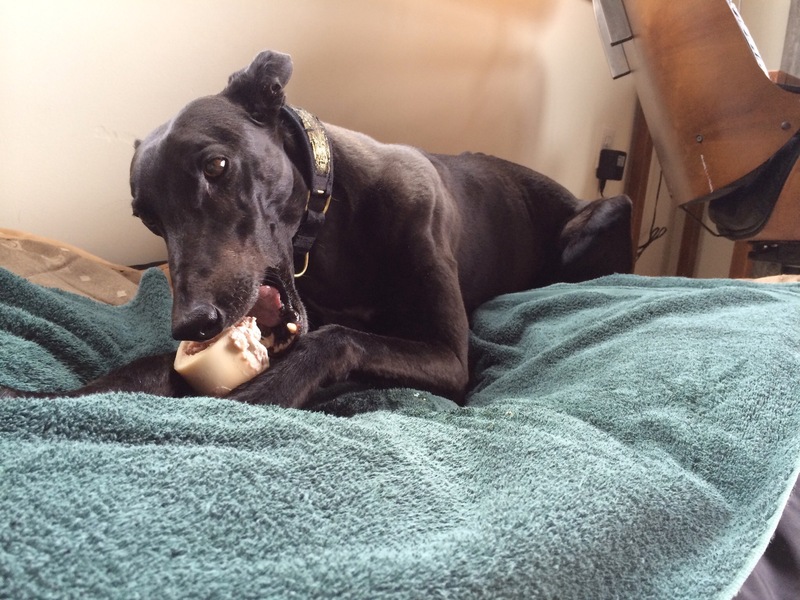 Tiger hopes you’ll consider adopting a black dog from a rescue or shelter. They are adopted less often and killed at a much higher rate than dogs of any other color, both here in the U.S. and worldwide. 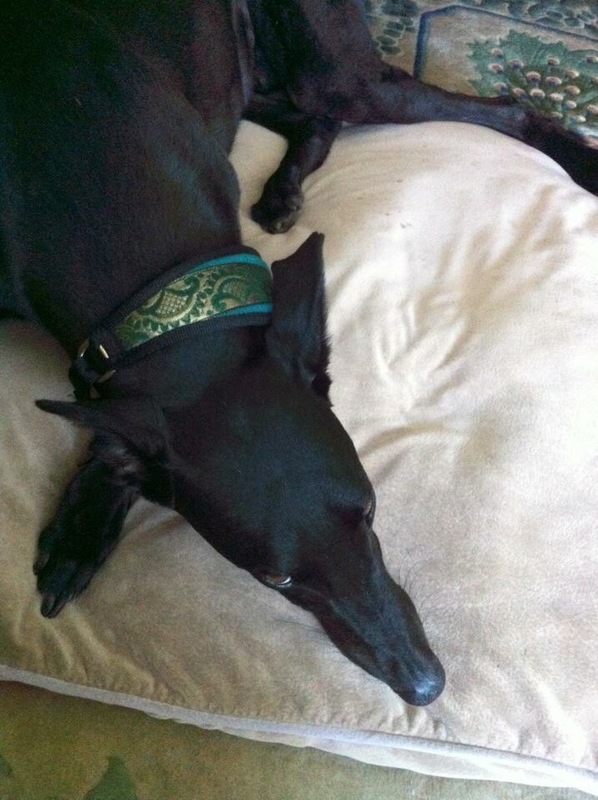 Please consider opening your heart to a black dog. You won’t regret adding an elegant new friend to your pack. 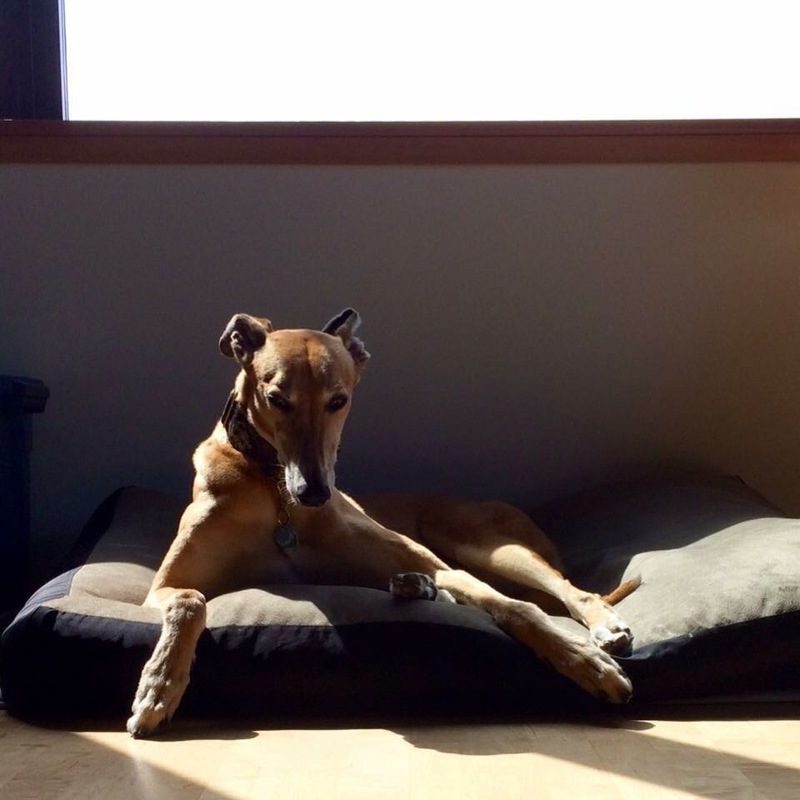 Four years ago, on July 16, 2012, our beautiful boy Truman came to live with us. I remember the first time we met. We had just lost our boy Larry and Tiger was despondent that his best friend was gone. We all were. 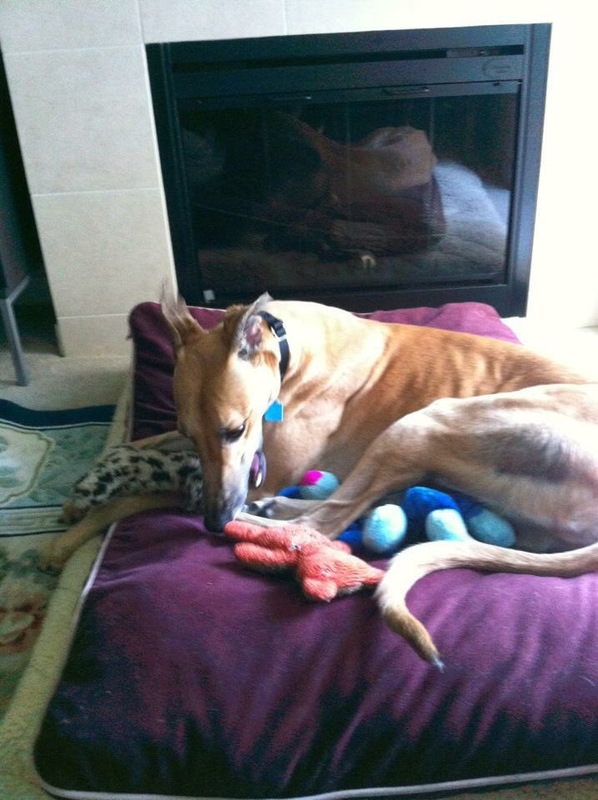 But Tiger really, really didn’t want to be an ‘only dog,’ so off we went to Greyhound Pets, Inc to let him pick out a new friend. After meeting a number of adoptable dogs, a beautiful red fawn boy came out to meet us. Tiger decided right then and there, that this dog was to be his new best friend. 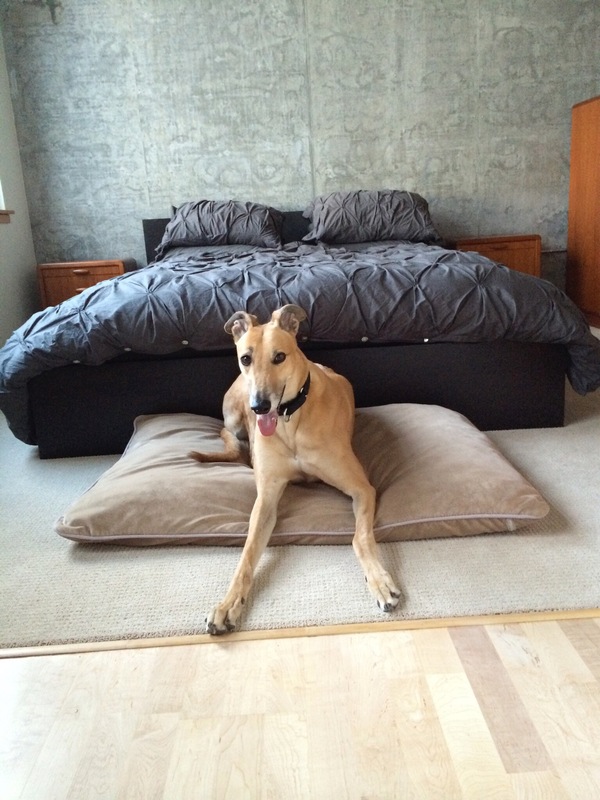 Truman was fresh off the racetrack and had never lived in a home. So much to learn! 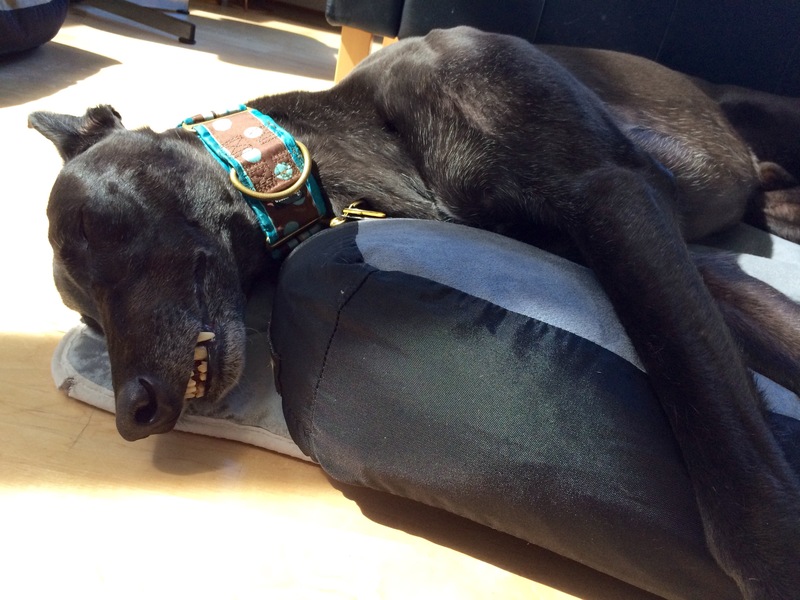 Stairs, glass doors, playing with toys, these are all foreign concepts to a newly-retired racing greyhound. He spent his first few hours in his new home staring at his reflection in a full-length mirror in our bedroom. Truman caught on quickly to playing with toys. 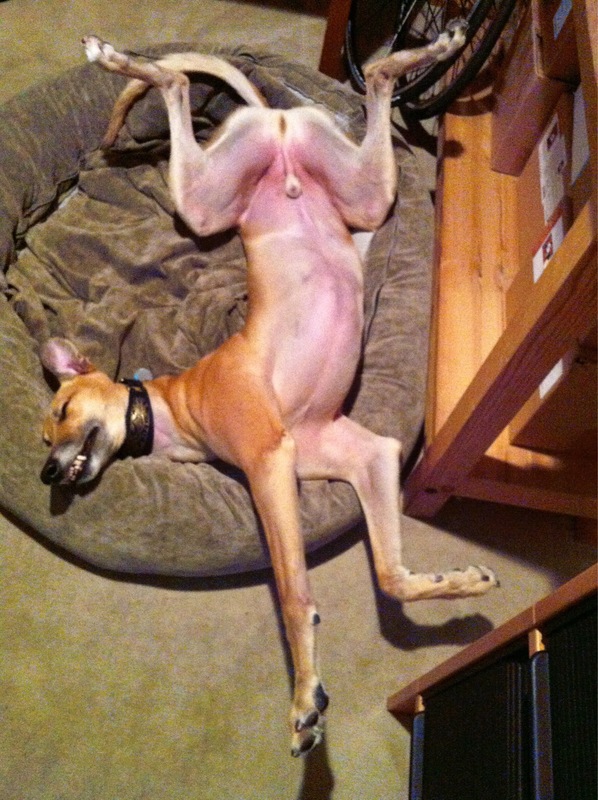 He also mastered the fine art of ‘cockroaching’ in no time. He even found a spot to practice yoga. Truman’s personality continues to evolve. He has learned to trust and love us. He is a loving and affectionate boy, who has become more confident and sure about his place in the world, and in our hearts. 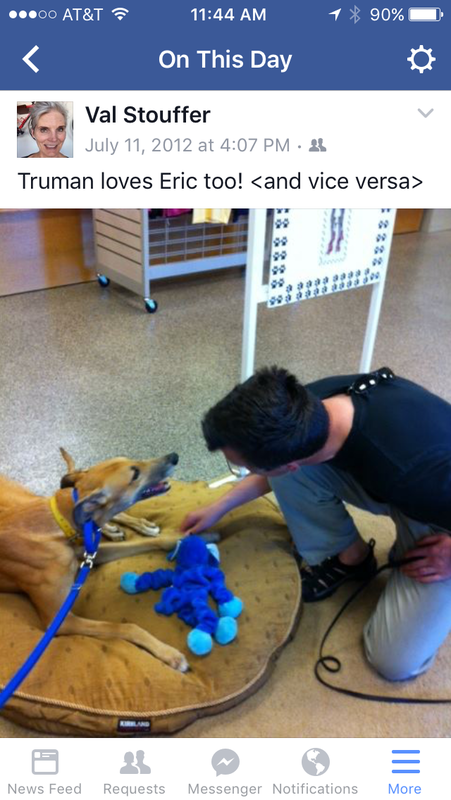 We love you Truman and look forward to celebrating many more ‘gotcha days’ with you! As we get ready to flip the calendar to July, we are entering into the annual Days of Dread for many of our dogs. I’m talking about 4th of July fireworks. Celebrating our nation’s birth by firing incendiary devices is cause for a major freakout for many dogs. Our Tiger definiely falls in the fireworks freakout category. 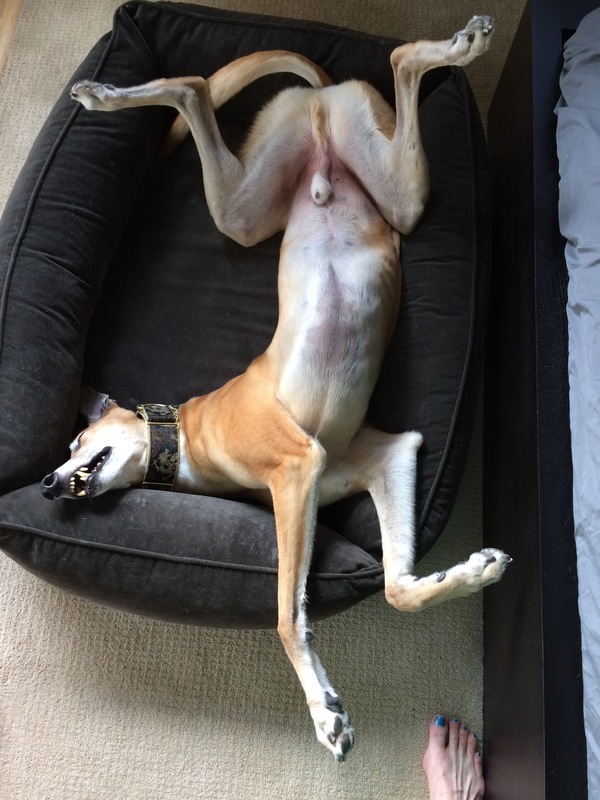 Larry, one of our previous greyhounds, also hated the 4th of July. We used to give him Xanax to help with his anxiety on that day. It never made him forget about the fireworks, but it mellowed him out to the point where he would at least be able to sleep, after retreating to the bathroom. 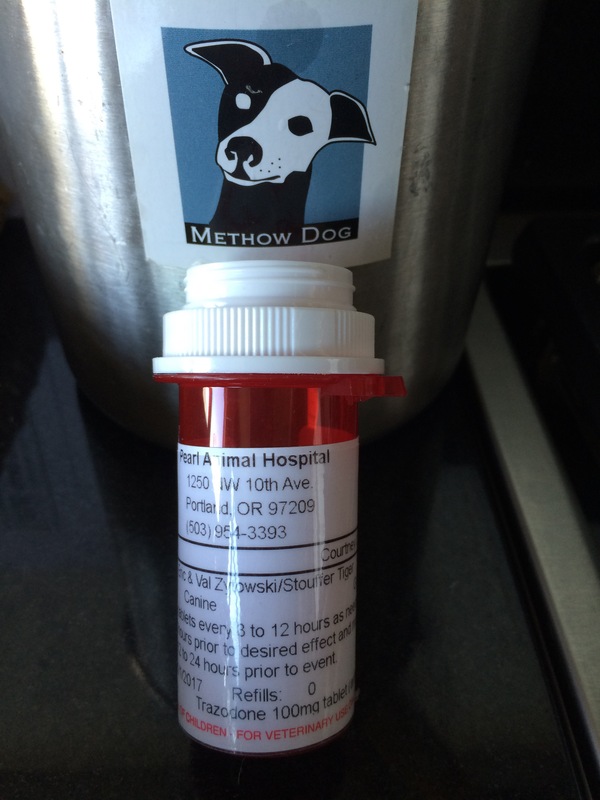 Our vet told us she prefers Trazodone to Xanax for dogs and filled a prescription for Tiger. She also recommended we try it out ahead of the 4th. So we did. Yesterday was our trial run. I gave Tiger some Trazodone at 3:00pm. By 5:00pm he was pretty zonked out. 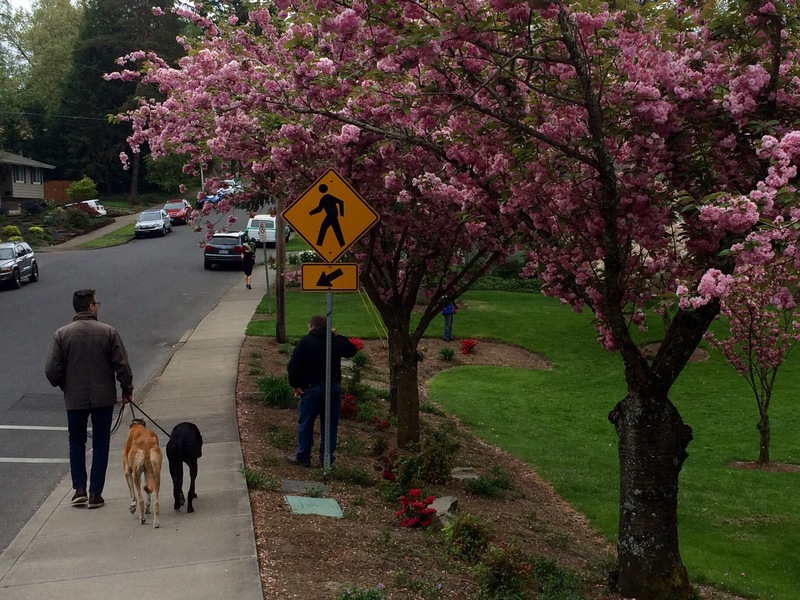 He was able to go for his regular walk at 6:00, but like a typical Portland stoner he slowly ambled down the street with no sense of purpose. He also stared off into space a lot. Oh, and his balance wasn’t the greatest either, so he peed like a girl dog. He remained in this somnambulant state for the rest of the evening. Next morning he woke me up with a sloppy kiss at the usual time. Tiger is a very reliable fur alarm. He played with his toys and danced around while I put the leashes on him and Truman. I was ready to declare the Trazodone experiment a success, until halfway through our walk Tiger yakked up that yellow bile that dogs do sometimes on an empty stomach, or after eating grass. He clearly was still feeling the effects of his altered state. After breakfast, he fell sound asleep. My poor boy was clearly nursing a hangover. 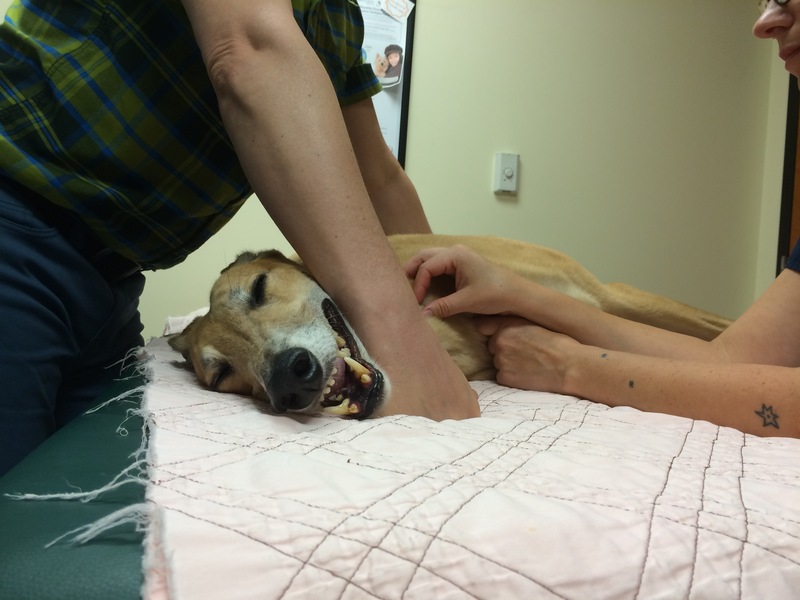 I called the vet to report all this and find out it was a typical reaction to Trazodone. We will give Tiger a slightly lower dose on the 4th. I should add that it’s not the official fireworks displays put on by municipalities that are the problem. It is the clueless yahoos who feel compelled to buy and shoot off their own devices, often for days before and after the actual 4th. 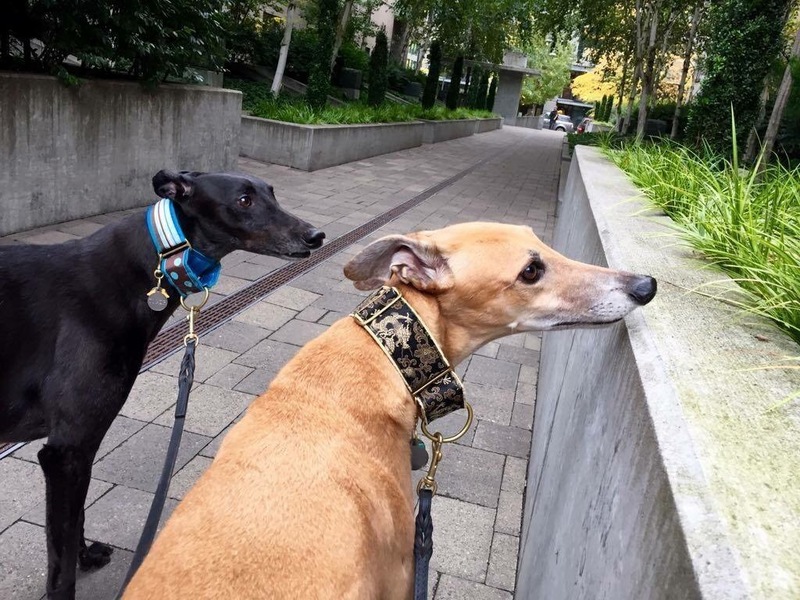 The sudden, random exlposions at close range in an otherwise quiet neighborhood are off-putting for most people, and are terrifying for many animals. Some estimates place fear of fireworks at 40 percent of dogs. Talk to any animal shelter and they’ll tell you that July 5 is their busiest day of the year for runaway dogs. So please leave the fireworks displays to the professionals and spare the rest of us from your annoying pyrotechnics. Visualize waking up on July 5 with all your fingers intact and the neighborhood dogs enjoying a peaceful day at home. 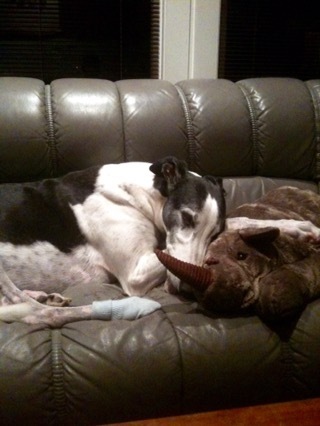 Our beautiful boy Truman was recently diagnosed with Pannus. Pannus, or Chronic Superficial Karatitis, is a progressive autoimmune disease of the cornea. 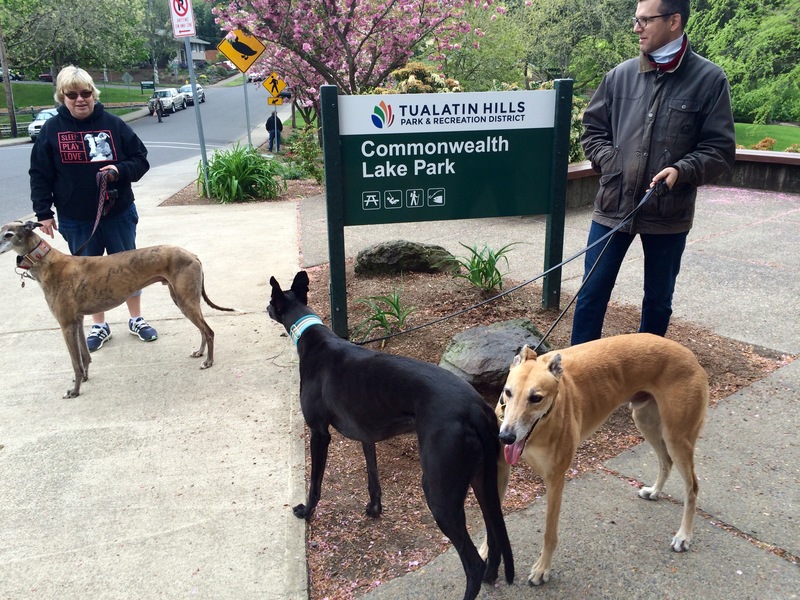 No one knows what causes it, but Greyhounds are among a handful of breeds that seem to have a predisposition toward Pannus. Other factors can include living at altitude in very sunny areas. Truman did spend part of his racing career in Colorado, so perhaps that was a contributing factor. However, living in the Pacific Northwest, generally considered to be the low UV light capitol of the U.S. works in our favor going forward. Signs of Pannus include a pigment infiltrating into the cornea. 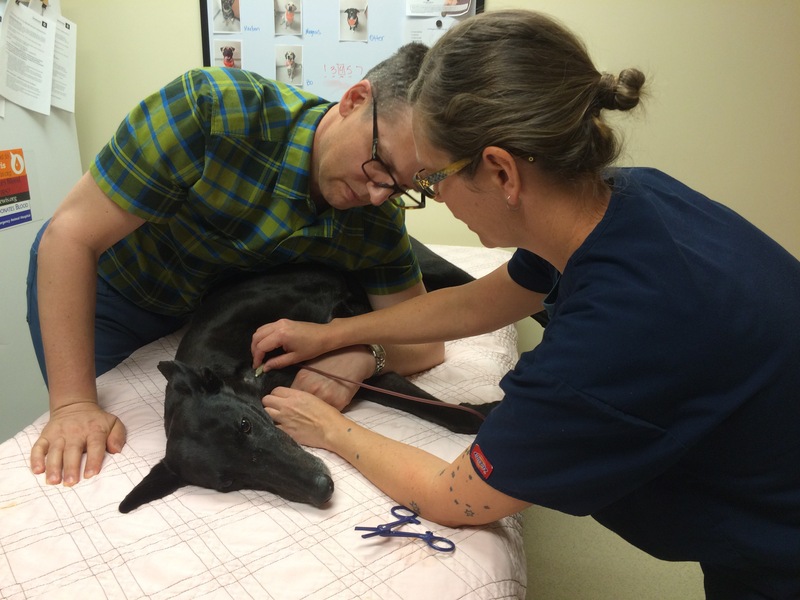 Our vet noticed the more obvious brown pigmentation on Truman’s right eye during our annual wellness exam. 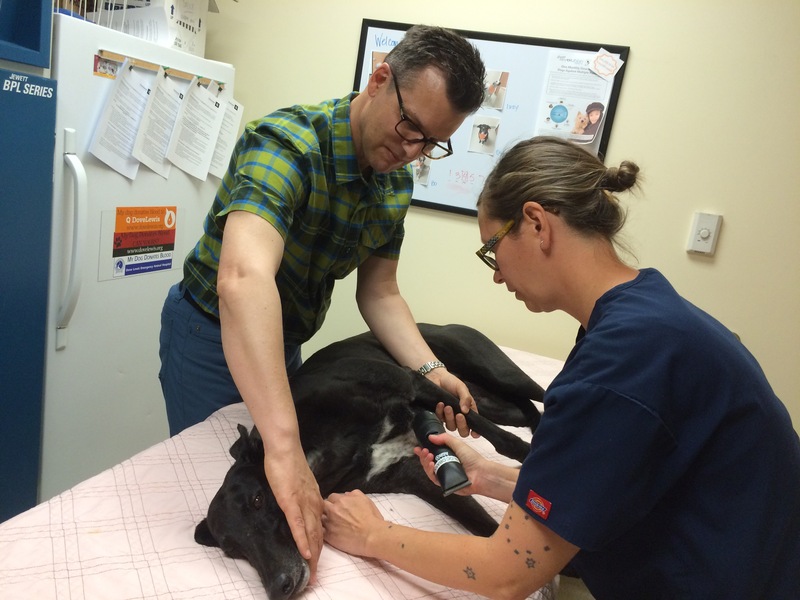 Truman wasn’t experiencing any obvious discomfort, but our vet wanted him to see a canine opthamolologist right away to figure out what was going on. 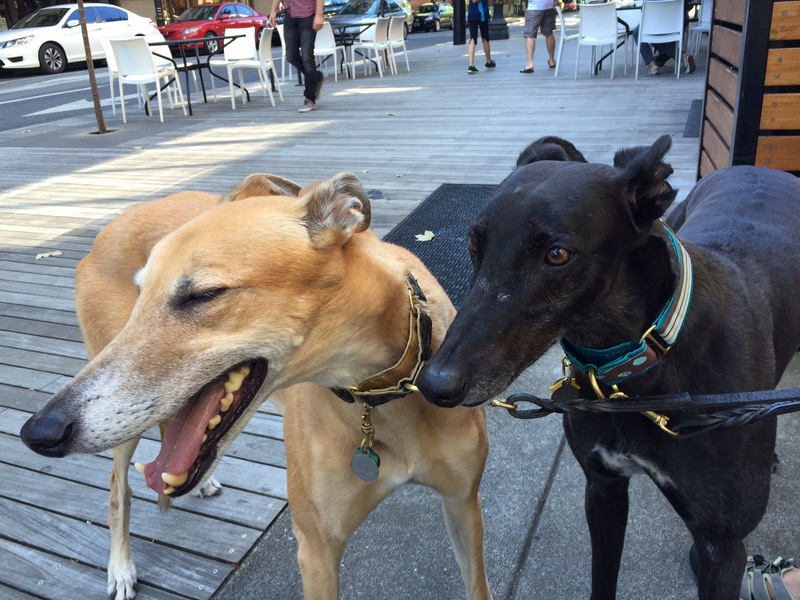 I was aware of Pannus, and knew of a couple of Greyhounds that had it. 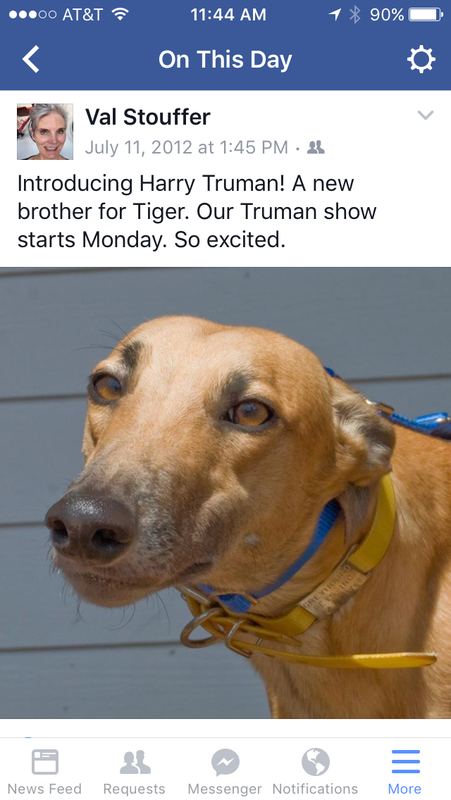 But it certainly wasn’t on my radar as a possible cause of Truman’s eye issue. I fully expected to hear that he had simply scratched his eye playing, sniffing bushes with thorns or rubbing his head on something with a sharp edge. The diagnosis though, was Pannus. 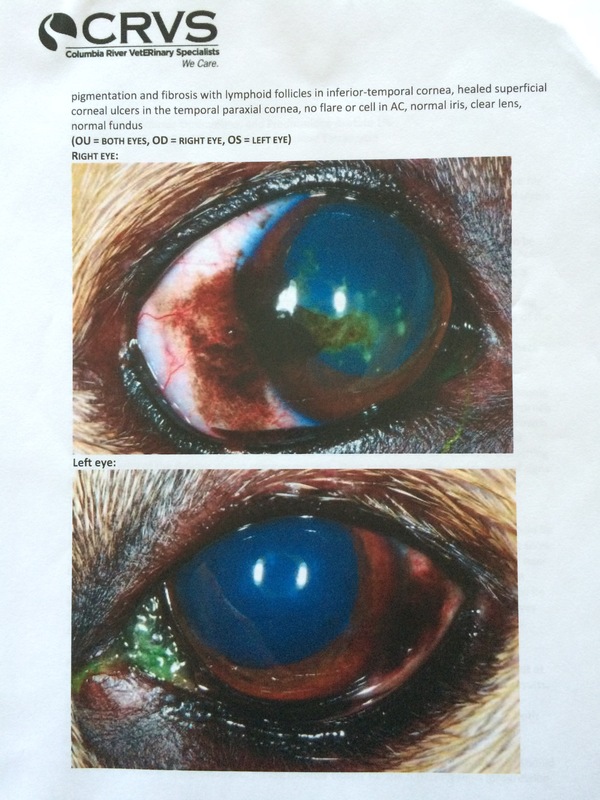 He also had some corneal ulcers, which were treated with Terramycin, a topical antibiotic. 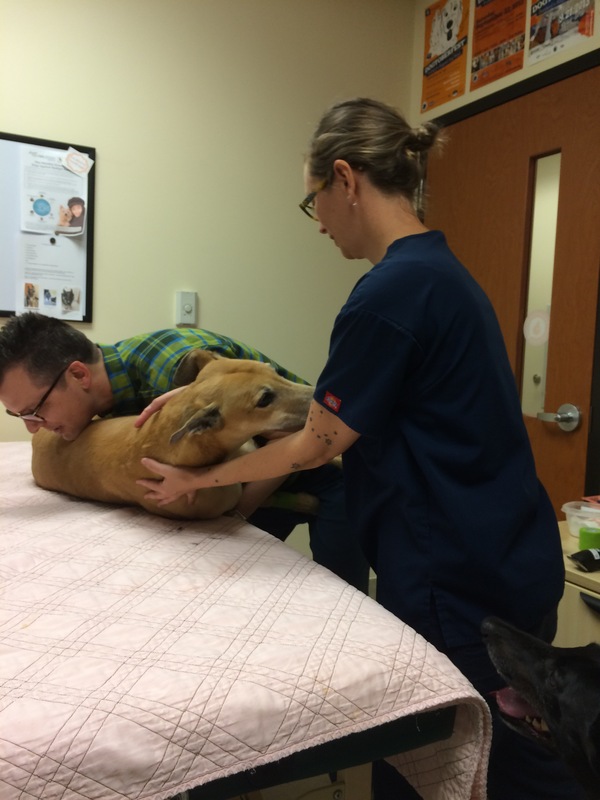 The ulcers responded well to the treatment and were completely healed in a couple of weeks. There’s no cure for Pannus. 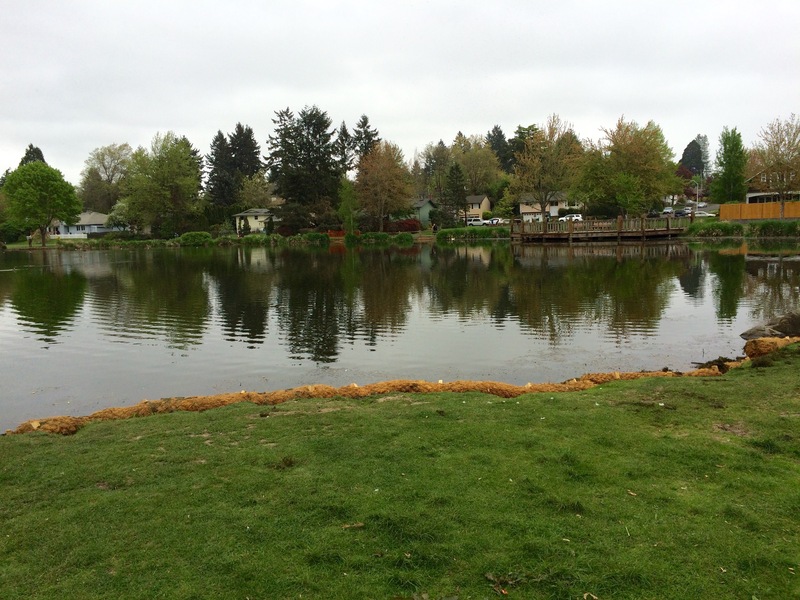 We caught the disease early and are managing it with two topical medications to halt the progress of the disease. 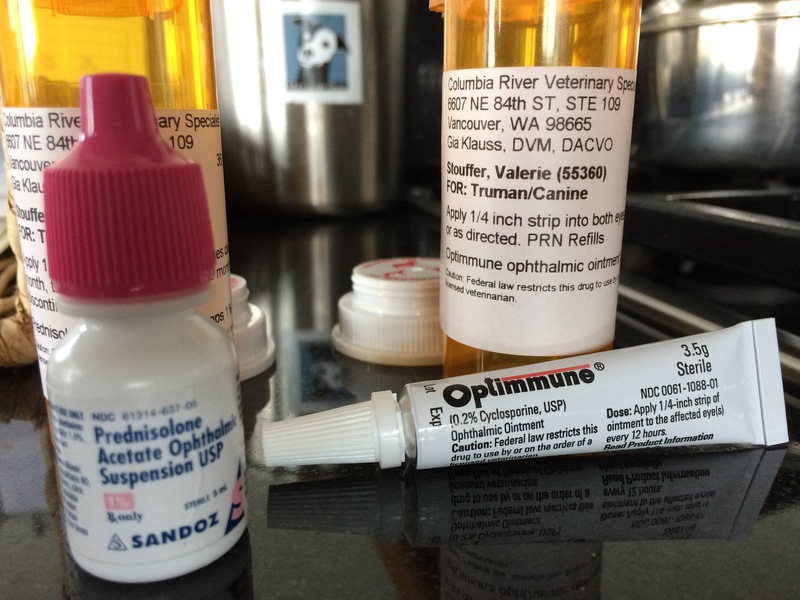 Truman will be on the Optimune, a cyclosporine-based ointment for the rest of his life. He’s getting the Prednisone Acetate, a topical steroid, for two months. UV light exposure plays a major role in Pannus. So it’s important to protect the eyes of the affected dog. No better way to protect the eyes from dangerous UV rays than with a cool pair of shades. 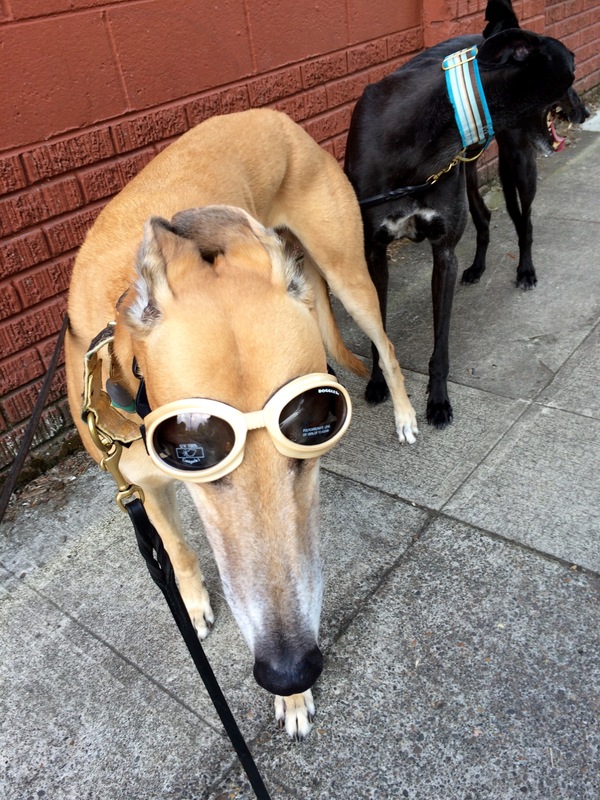 We got Truman a pair of Doggles at The Hip Hound on trendy 23rd Avenue in Portland. Trying on fashionable eyewear is exhausting work. A disco nap was in order after an afternoon of shopping. Tru doesn’t exactly love his new sunglasses, but he tolerates them…and he sure does look supercool wearing them. 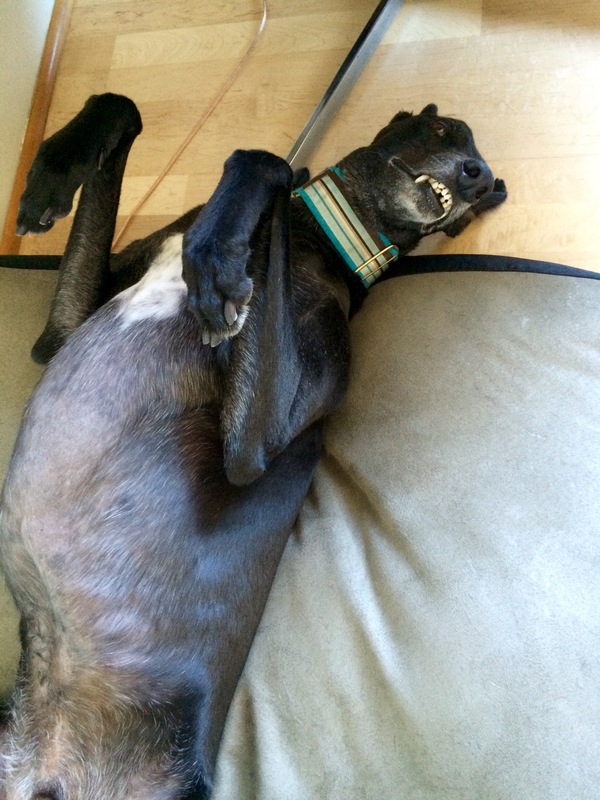 Truman has suffered no visual impairment from Pannus. 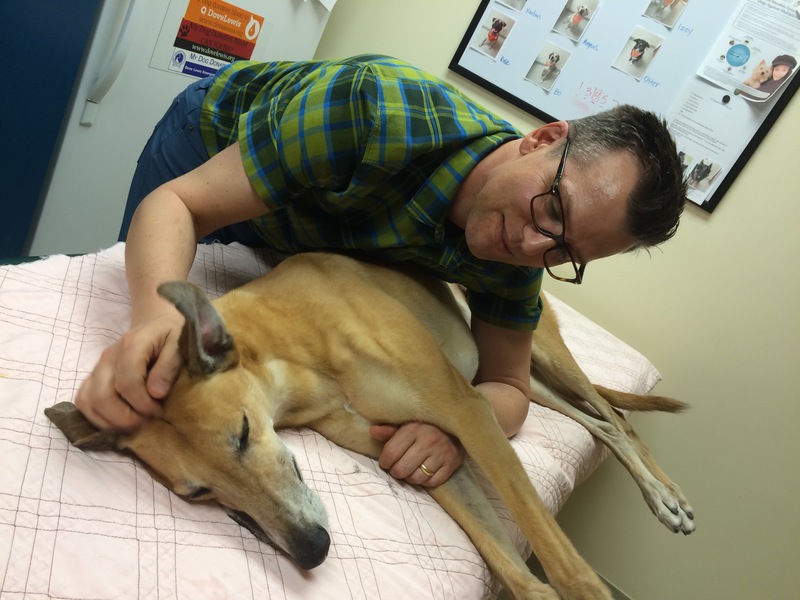 The month-long therapy has reversed a lot of the blood-vessel in-growth, so we are cautiously optimistic that we have this under control and that our sweet boy has a long life ahead of him as a well- sighted sighthound! 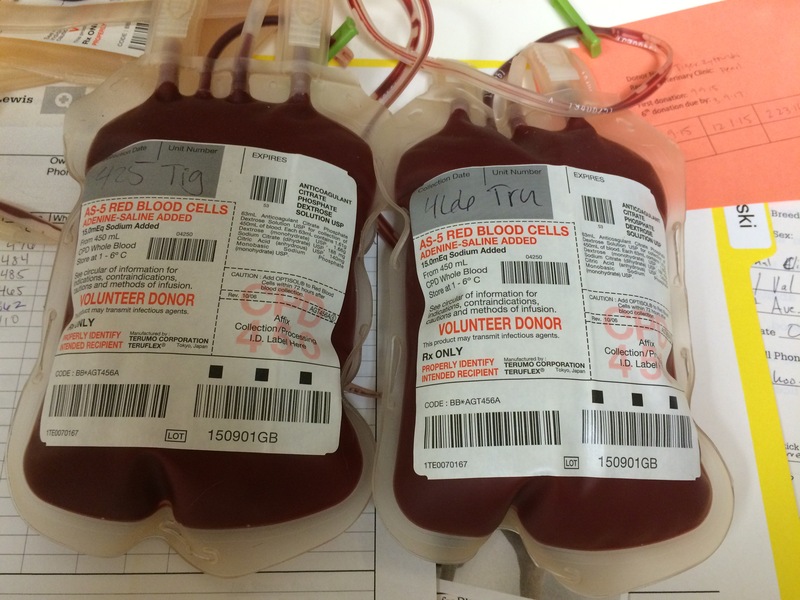 Humans aren’t the only ones who need blood transfusions. 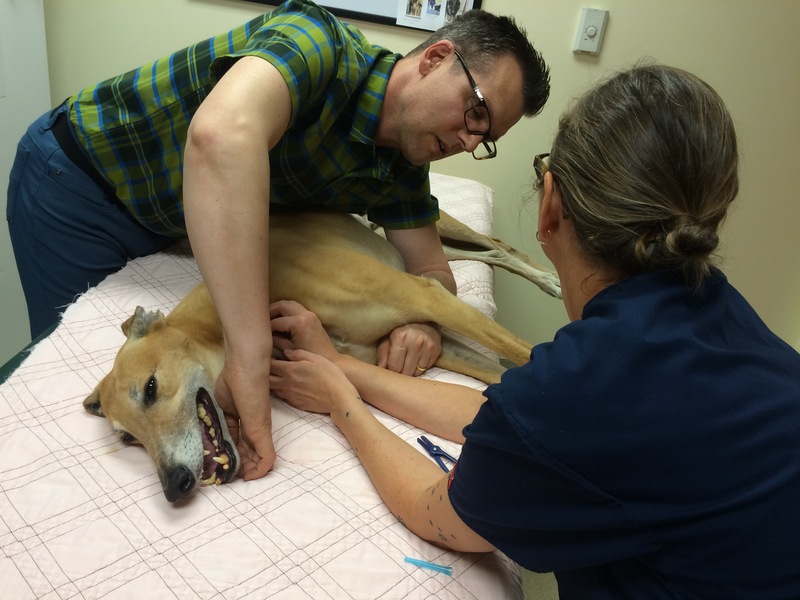 Our animal companions can also suffer an emergency requiring life-saving blood products. 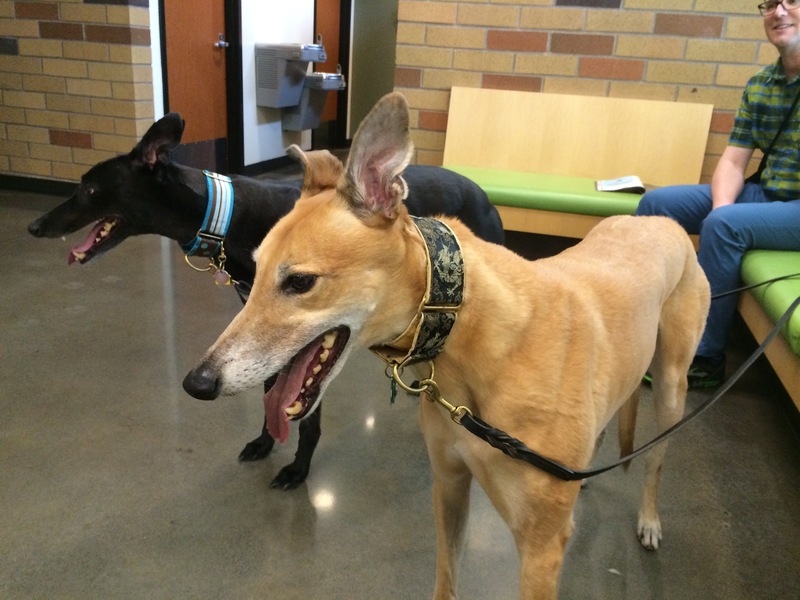 Tiger and Truman are among the 125+ canine and feline “Superhero” volunteer blood donors at DoveLewis Emergency Animal Hospital in Portland. They donate blood 4 to 6 times a year. And last week was one of those times. Tiger makes sure all their paperwork is in order. 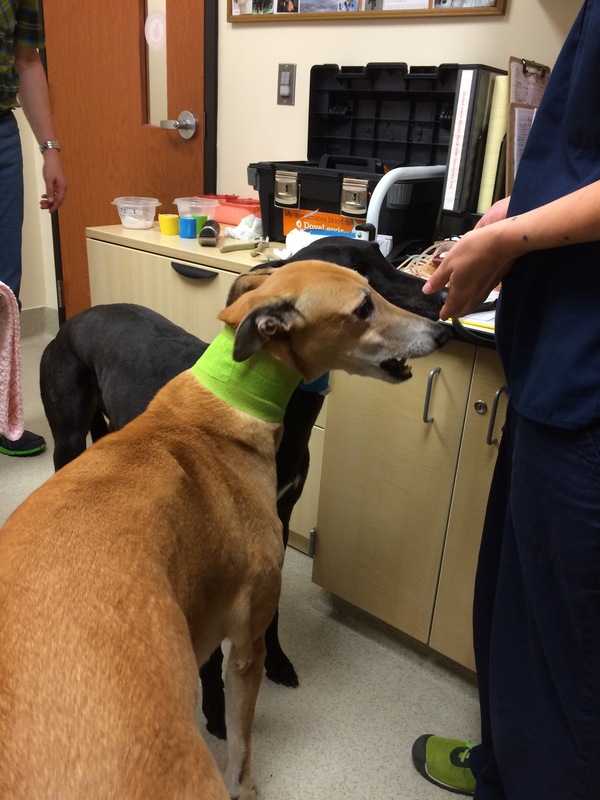 He was also making sure he didn’t miss out on any treats from Blood Bank Program Director Jill Greene. 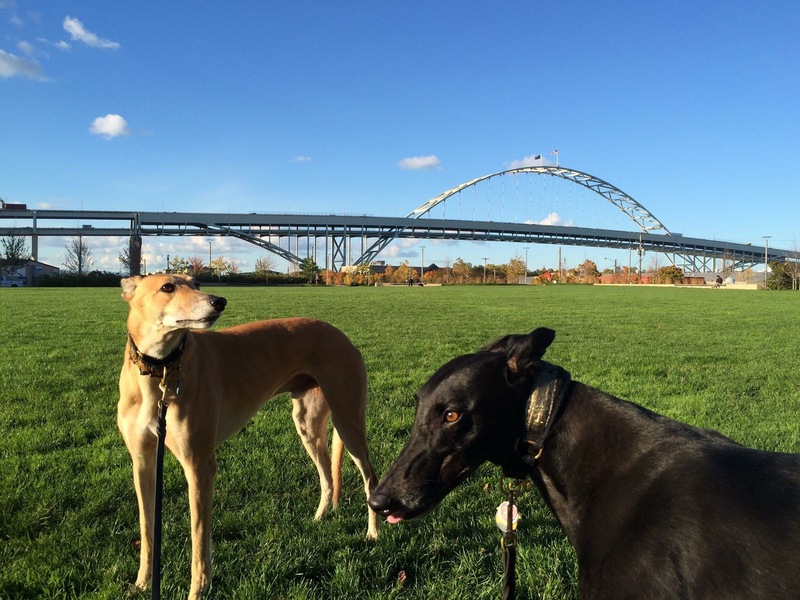 Tiger and Truman have been blood donors for about a year and a half. Tiger was first up. He quickly settled into the routine. 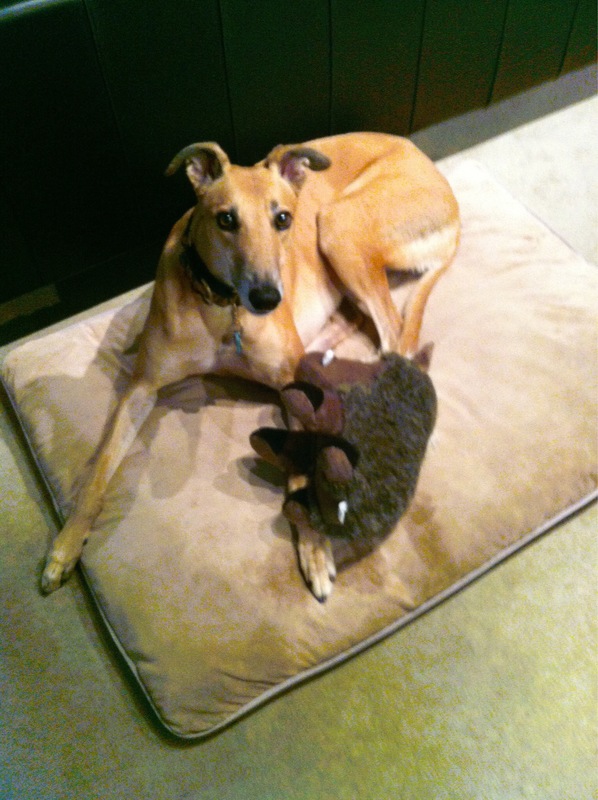 Greyhounds are very desirable blood donors because they typically have a universal blood type that any dog can receive. They are also very easy to work with. 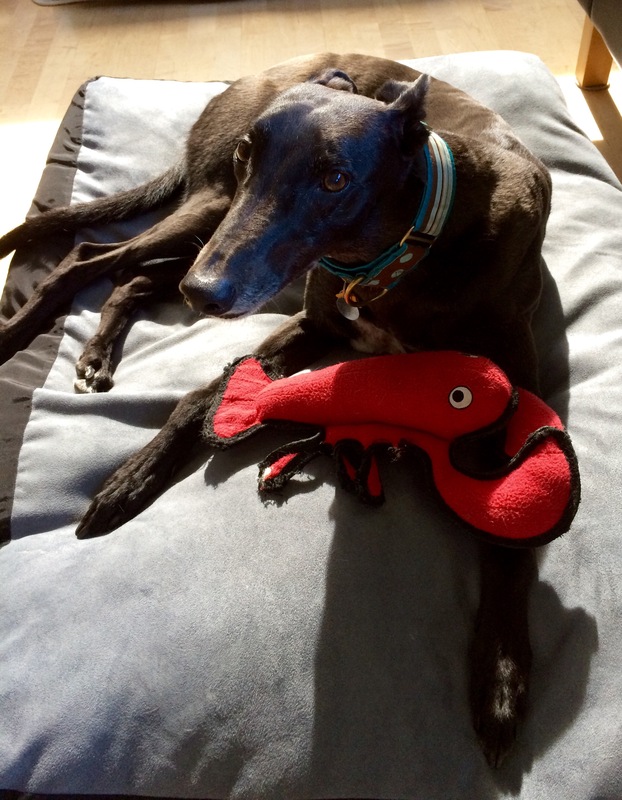 Greyhound blood has a higher red blood cell count, lower white blood cell count and lower platelet count than other dog breeds. 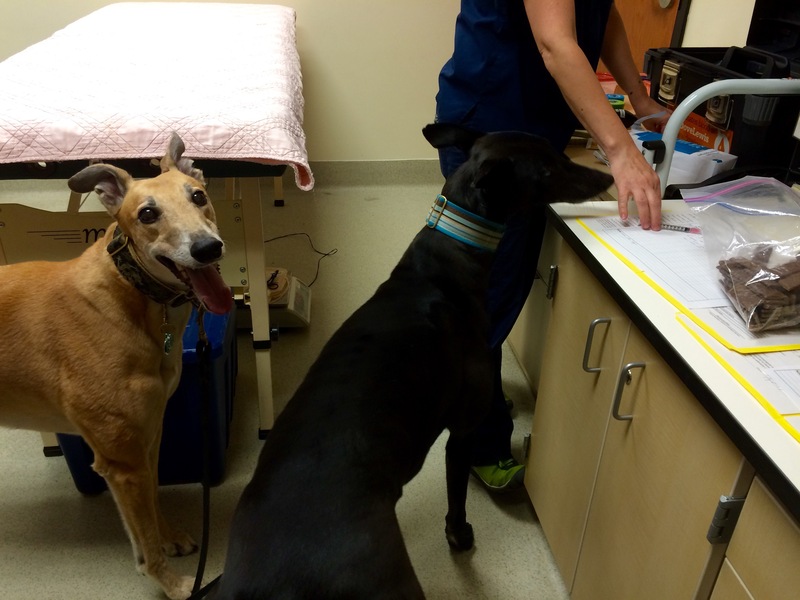 DoveLewis very carefully screens all their volunteer blood donors, both during the initial consultation and tests the dog’s blood before each donation to make sure everything looks good and they can safely donate that day. 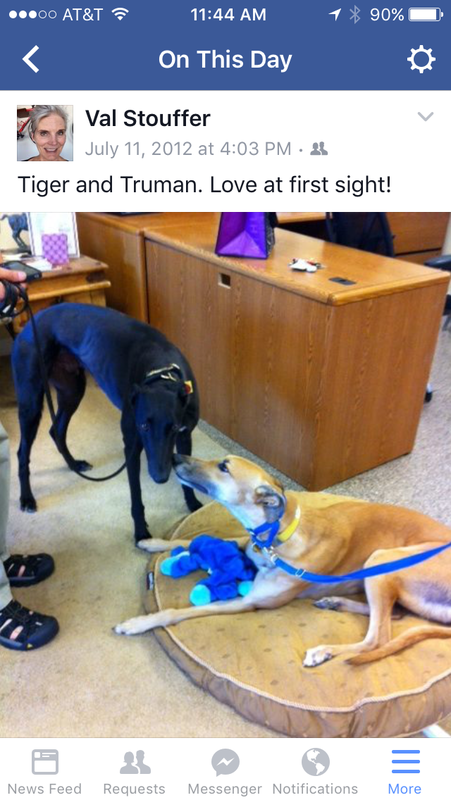 Tiger and Truman passed with flying colors! 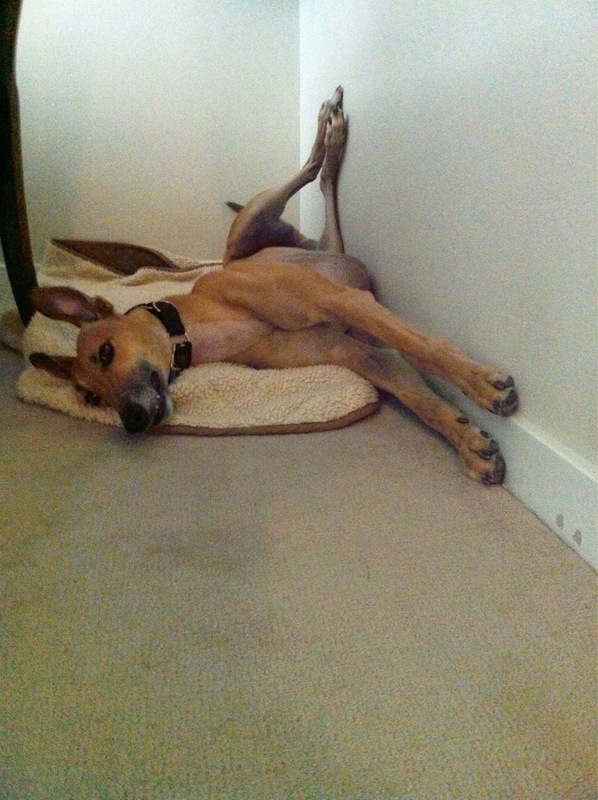 As with Tiger, Truman is super-chill with everything. 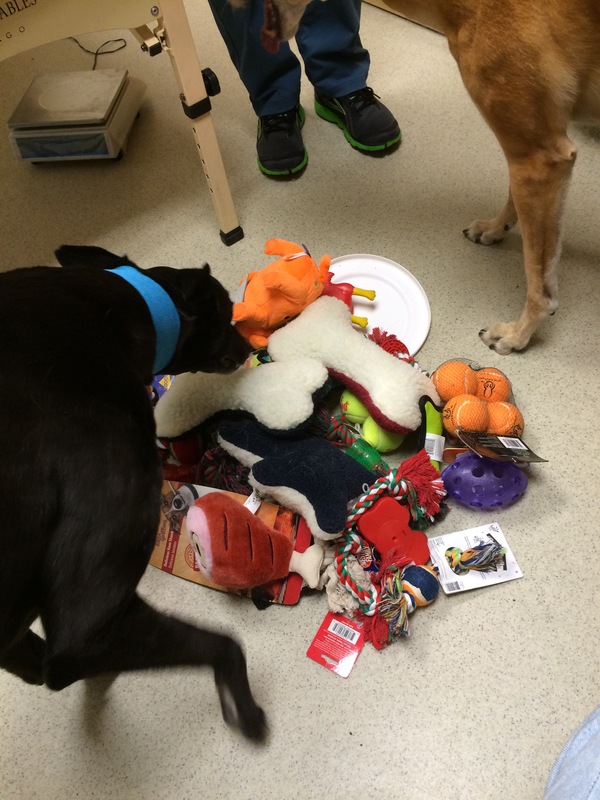 Of course the best part of donating blood, as far as Tiger and Truman are concerned, is when it’s all over, and Jill hauls out the toy box. Each dog gets to pick out one new toy to take home. …and there are more treats involved too! 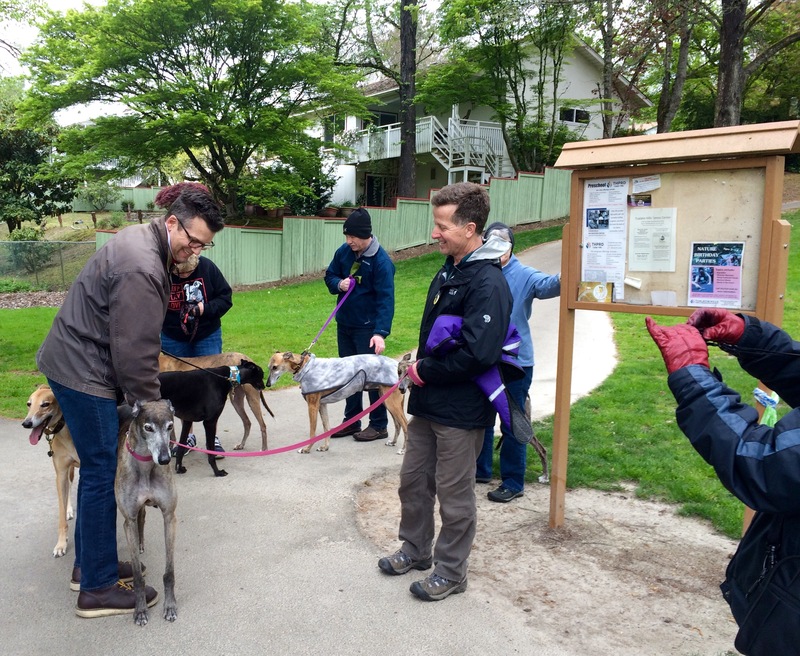 Each dog donates a pint of blood, which typically goes to dogs here in the Pacific Northwest. 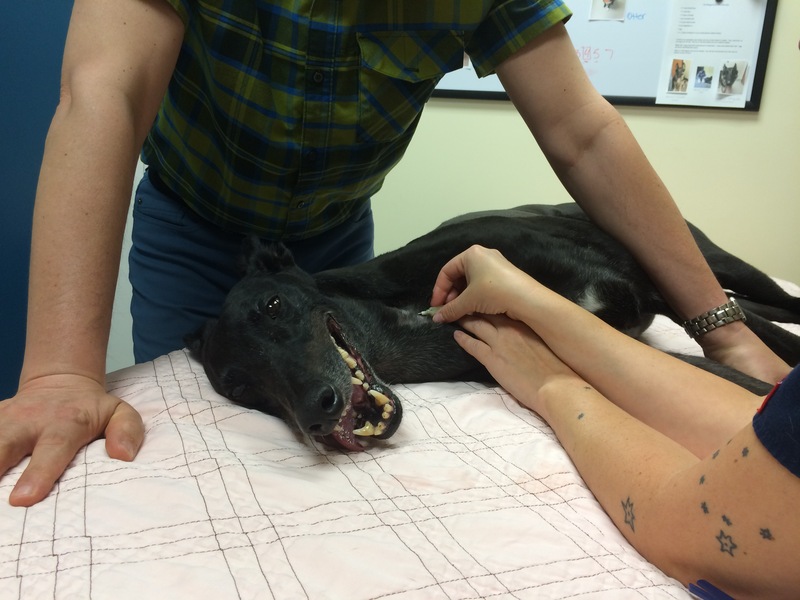 But Jill told us, just the day before we came in, DoveLewis sent blood to a veterinary clinic in Palm Beach, Florida. Each donation appointment lasts about a half-hour. We humans hang out with the boys during the whole process. 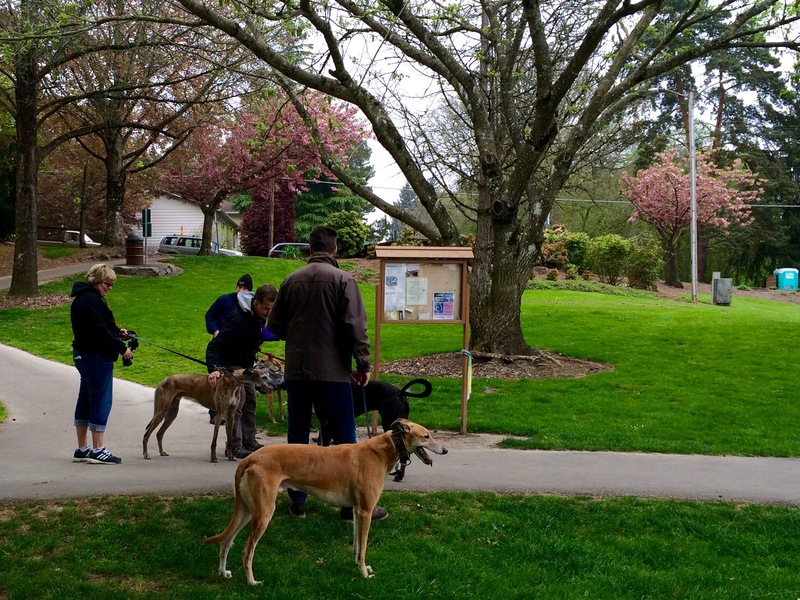 If you think your dog would make a good volunteer blood donor, you can learn more about it on DoveLewis‘ website. Blood bank info is found on the Community Services tab at the top of their homepage.